Even we only started to announce properties in 2006 through a related website, as property finders, here are some references of people who bought and restored houses using our services and others of people who rented some of our properties to spend marvellous holidays in Galicia. Just a note to say what a lovely holiday we had. Please thank Antonio and Loli for letting us use their beautiful house. Thank you too for making the arrangements. 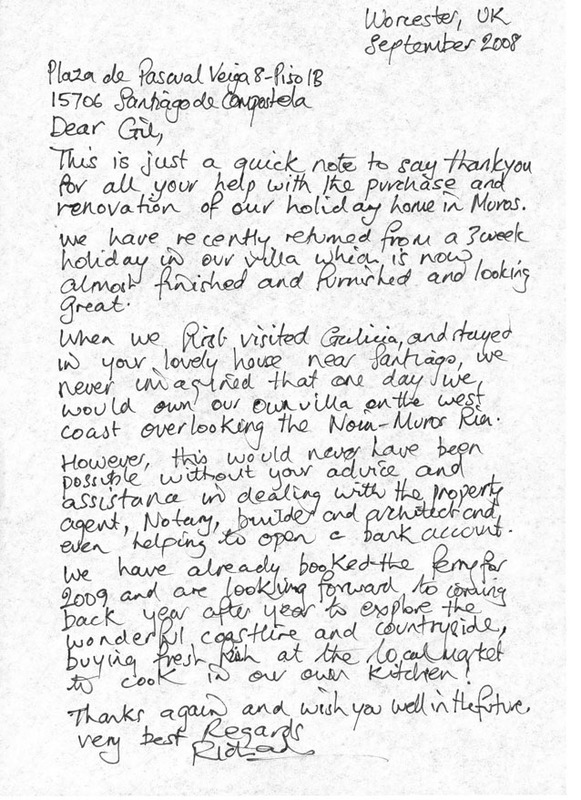 Just a quick note to thank you very much for arranging our holidays at Villa Celia and for your help when we got there. We had a wonderful holiday in a beautiful part of Spain and the most fantastic house! It really is a holiday we will remember for a long time. Please pass our thanks to Jose and Maria who meet us and were very kind to us and to the owners of the house for letting us stay in such a fantastic location. I wanted to thank Edmundo for a wonderful stay at his villa. It was more than we expected. We loved the town of Sanxenxo and the beautiful views from the villa. We will definitely recommend this villa to our friends. Could you please pass on our thanks to Javier & Marta for the use of their villa for the last couple of weeks - we had an excellent time, the location was ideal and the standard of the villa was very high indeed. Just wanted to send a quick note thanking you for helping with our recent trip. Casa Ignacio was, as expected, very nice and centrally located to many of the locations we wanted to visit. Rafa and family were very accomodating. I have passed your information on to friends who are considering visiting Galicia, hopefully it will lead to additional business for you. Just returned from our vacation. We loved your house. Thank you so very much for making the transaction happen so easily. We enjoyed the pool often as well. Upon leaving Villa Salguieros, we drove to Braga and then onto Lisbon. We were lost with the language but managed just fine and enjoyed the final few days of our 17 day vacation. Again thank you. Thank you for the use of villa Salgueiros for the past week. We both thoroughly enjoyed our stay and thought the villa was tremendous. The garden was lovely and we watered the plants every day. The pool was idyllic and to sit BBQing each night with a glass of wine very relaxing. We also managed to get to your restaurant and found the food excellent. We had time to spend a day in Santiago and another day went to Noia and then round the coast. Thank you for your recommendations for these trips. All in all a lovely break and one we thoroughly enjoyed Thank you very much for your patience and help and we both hope you will feel better soon.